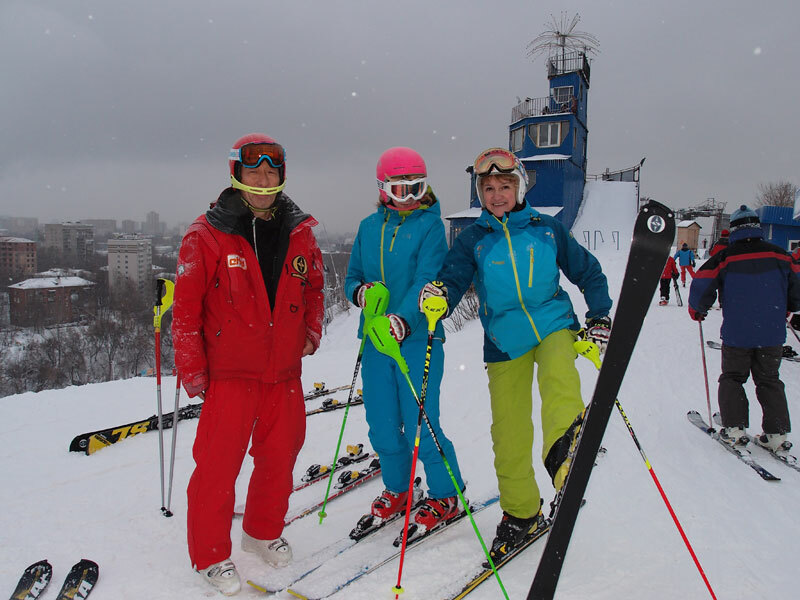 In the spring of 2016, when the snow already was melted in Moscow, it was possible to “touch” slalom ski Ogasaka Triun SL 16/17. This site has a series of articles about it. Now the 2016/17 season has already begun. 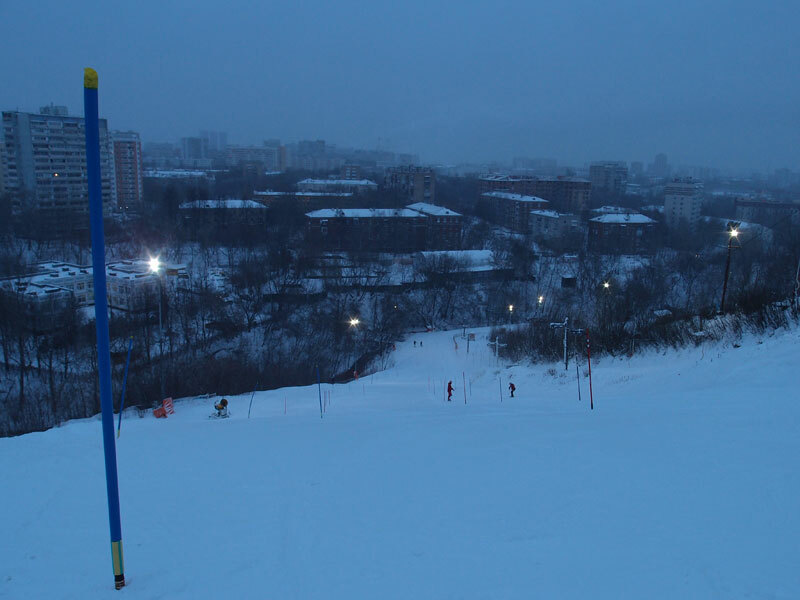 Ski resort “Kant” was opened on November 13, 2016, and in general snow coverage appeared so early in Moscow for the first in last 137 years of observation 🙂 So, it became possible to test skis on the snow. (Slalom ski Ogasaka Triun SL). 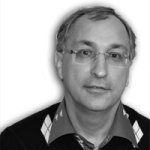 Next three articles about the comparison of changes in construction of models 2015, 2016 and 2017 years. As it turned out, slalom model change remarkably from year to year. (Ski Ogasaka Triun SL 16/17. Part 1, catalog, Ski Ogasaka Triun SL 16/17. Part 2, sidecut shape, Ski Ogasaka Triun SL 16/17. Part 3, stiffness and deflection). 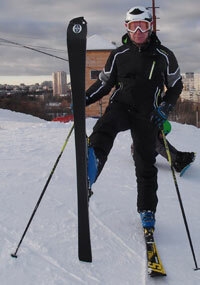 Finally, the article about the match sidecut skis and shape of deflection (Compliance ski sidecut shape to deflection. Part 2). 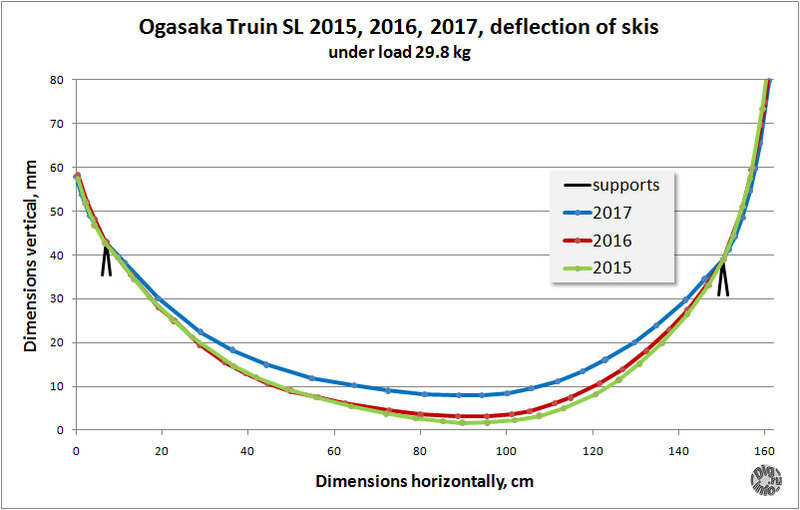 In this article, to my delight was found that from year to year, this figures in slalom skiing Ogasaka improved and in the model 2017 it is possible to speak about the perfect accordancce of sidecut and deflection. It was a doubts that in the 2017 model year stiffness of the ski became too high for “usual amateur slalomer”. Here is a comparison of deflection under load of about 30 kg. The difference in deflection is about 6-8 mm, these figures correspond roughly to the applied marker marks on the skis “race stock”, where every millimeter usually gives a very noticeable change in the stiffness of the ski. Therefore, there were fears that the ski will be hardly put intoturn,” especially at the Moscow hills, where the speed is lower than in the mountains. 3rd December 2016 Iwamoto san brought for testing slalom skis 165 and 155 cm. We tested them with our club and try to give for testing to everyone. It continued on next day of weekend. 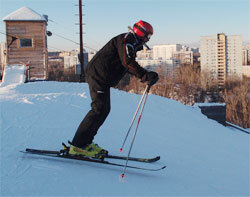 In testing took part not less than 15 of strong by Moscow standards skiers. Then Iwamoto san left me skis 165 cm for further testing, that I wanted to make a “more thoughtful”. It took two days of free skiing. 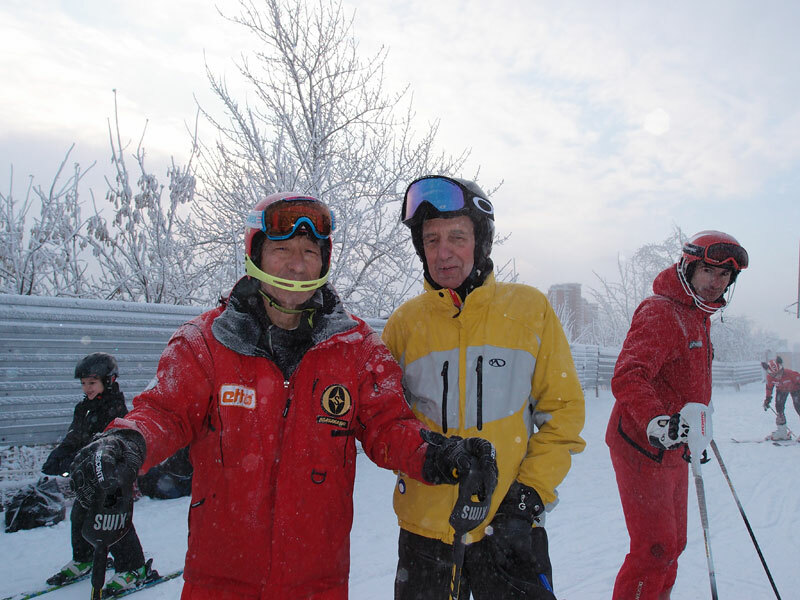 Still, not only I have tried to give ski for testing to friends, and I could compare skiing on Ogasaka with their skis. Finally we were given the opportunity to conduct training on the slalom course. The snow was sufficiently hard. So there are 4 days of active testing in the free skating and one day on the slalom track. It is already possible to draw conclusions. 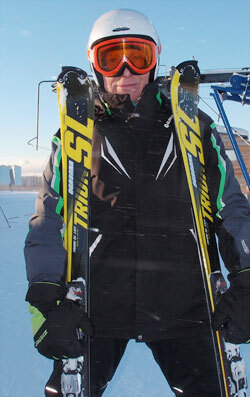 It remains to try skiing on the ice, but there is no such possibility yet. To begin I will share my impressions. In principle, when testing skis it used a certain methodology of filling parameters in a questionnaire, but I think it’s not good for sportive ski, although there is some objectivity. My impressions of course are subjective and may not coincide with the impressions of others. Then everything fits “laboratory” measurements. 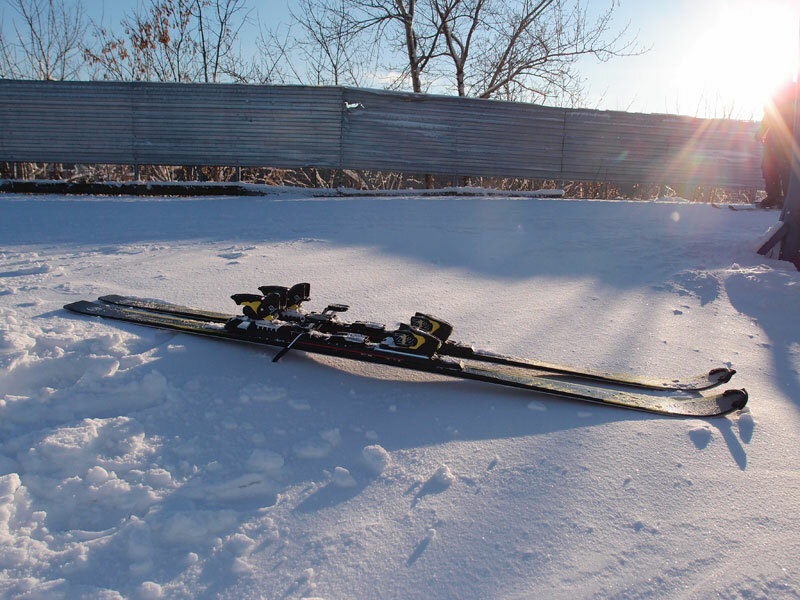 Skis are very stable in an arc, regardless of the quality of the coverage. So if in one turn is present and hard and softer snow, the ski pass very stable, not twitching. Looks like should be so because of accordance of deflection shape and sidecut. Skis itselves like to pass along the arcs without slipping, so push at first part of turn and then pass quietly, without jerking. However, if you want to “beat the dynamic”, the skis work out it. Bindings on the test skis in addition to fit a shoe size shoes allow to shif boot back and forth with respect to the recommended mark. I liked it right on the mark. 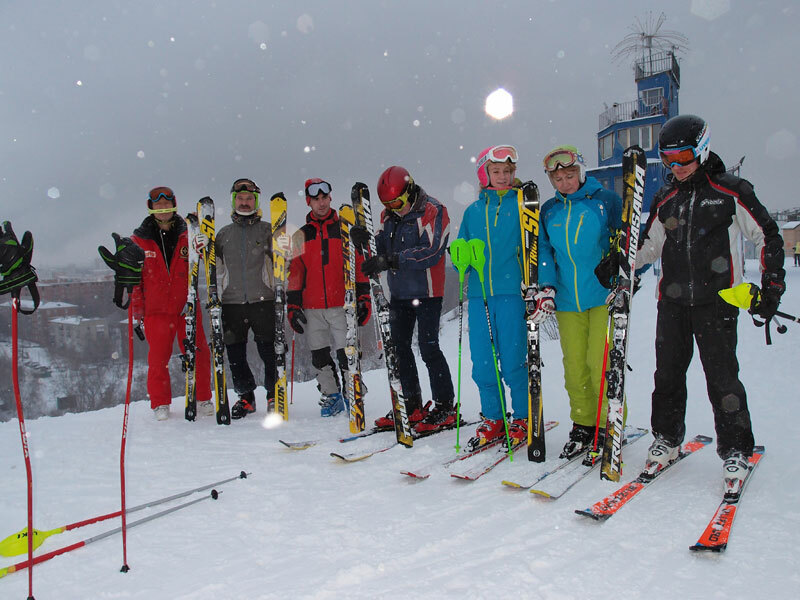 But our clubmates who have long experiens of ride on Ogasakah, moved a centimeter ahead and made sure that the ski has become to “shoot” from turn to turn. If to compare model by model, Ogasaka the 15th year the most obedient, the 16th year the most “toothy” and dynamic, and the 17th year the most stable. But mark again, not so much differences. On the slalom course I, again, had a doubts about the stiffness of skis of 17th year. The fact is that, unlike in free skating, in the track I can not cleanly cut all turn. Therefore, there were fears about how these skis will behave, when it is necessary to throw it from turn to turn with slippage. These fears were not realized too, a 17-year ski behaves as friendly as the 15 and 16 model years. Here this article does not end 🙂 I hope that colleagues will complement their impressions that I word-to-word give here. I’ve tested Ogasaka slalom skis 155 cm. Was made 6 runs on #3 slope of Kant sports complex. 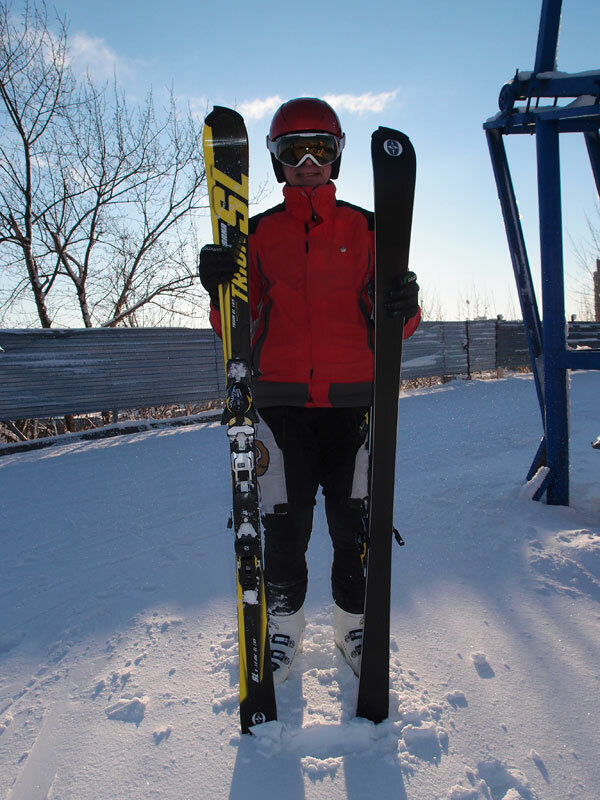 Skis greatly put into turn, and … unfortunately something not allow me fully enjoy all the benefits of these skis. It was necessary to put some effort to not suffered sideways. The impression was that edges are not very sharp. Feelings that ski “shoot” at the end of the turn, I also could not reach. Perhaps a longer test would lead to a more satisfactory results, but for me this goal did not stand, I am fully satisfied with his slalom skis Stockli 155 cm and continue to use them. 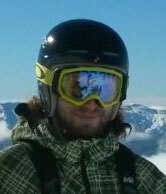 First, when put bindings for recommended center, not completely understood as to work on ski. The feeling was that the ski lay to all edge and go along a path defined by its own geometry. At what point it is need to push in order to thrown in the next turn I not understood. Then, on the advice of Nick, moved bindings 0.5 cm forward and then that I felt them. Ski has become very nimble. On the third run I found phase of turn in which it is necessary to maximize loading, then it need only quickly only flip body and pass ski under a body. Absolutely not similar to Blizzard are, carry Ogasaka on cutted arc is easier, but there is no so impact from the load, like Blizzard have. The question “what skiing is better” for myself, I formulated an answer that both are in their own good, a matter of habit. Slope condition – hard corduroy. This model from the Japanese manufacturer, is a “race stock” slalom ski. R = 12,6m. To begin with that ski scared by its great longitudinal rigidity! When the “squeezed” it by hands, having strong doubts that I can cope with it. It feels like it was one of the toughest slalom ski in my practice! However, the test has dispelled these doubts! Ski was obedient to the astonishment and even comfortable! Only at the very beginning of the turn, they require a certain emphasis on the tip. But as soon as a tip “cling” slope, ski started to keep a clear, predictable arc. Moreover, in the phase of curve it was very insensitive to the change of the pose. In a large range of longitudinal balancing, it keep a stable arc! In other words – if you want go forward, you want go back and ski will keep a smooth arc! It is damped and with good vibration damping. Good tenacity along the arc was a few reduced with the original ski sharpening! But even in such an embodiment, the ski kept clear at all available to me angles and speeds! The impression that this ski laid some very correct geometry optimally suitable for its rigidity diagrams – so smooth and stable arc was in all its phases and at different levels of edging! But the final answer can only test on the track! Test slalom ski on a flat dense coating is not the best idea. It is clear that any slalom skis for tight smooth snow ride well, no differ race stock or shop option. For example, tests on Wednesday showed that the Ogasaka-2017 no better and no worse than my old Orions, though I know that tough slalom track Orions will be slower than Ogasaka. In Ogasake alerted that they stabbed to death, sinking at the slightest attempt begin turn from loading of tip. I have the almost shutter over head in first two runs. I look forward that on the ice this feature will result in their death grip. Generally slalom ski different from Carver’s by ability to conduct an arc of variable radius under the strict supervision of the skier – do not crush it, arc would still be purely to write, while Carver usually in such a situation starts to rattle and tear arc. Test it without the marked flags or Gummies track is very difficult. I would say it is impossible, so tests without the track light not those ski properties. 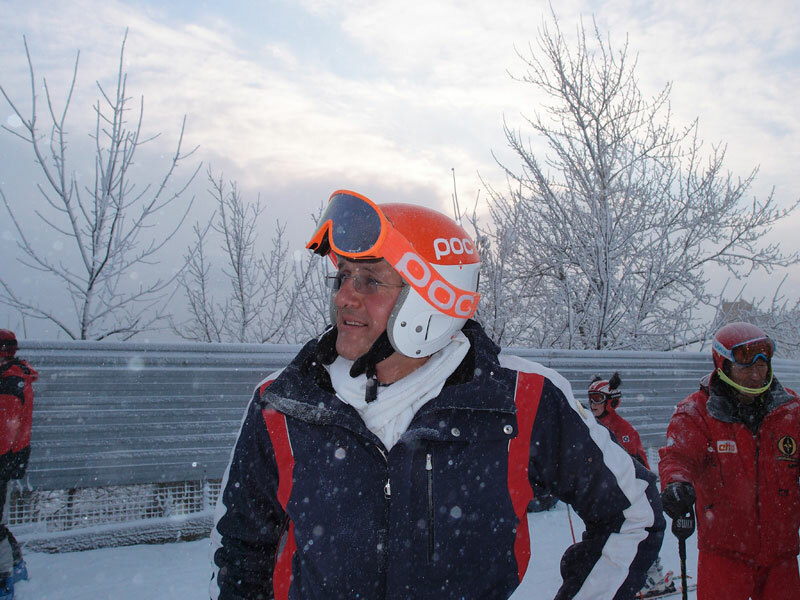 Here, for example, Alexander Zakharov at the ski.ru described skis as a rigid and strict, but obedient, and to me it seemed too lax and aquatic compared to the classical race stock of Blzzard or Voelkl. It may well be that on the icy track Ogasaka is a complete delight. The first impression – handling these skis indescribable. Do not balk at them with full force. Go along the arc, the arc turns cleanly incised. It’s amazing. even difficult to compare with other skis. Other skis do not behave such. These do not break down completely. Pops up on the hard firn and they do not vibrate, are very good, the arc is obtained. Skiing themselves turn lead arc ending arc easily, do not have to be pushed out of them. They do not give the impact of a steep bend chain, pushing not. Calmly completely pass into the next turn. I tried 165 and 155 cm and a special difference is not noticed. Skiing 155 normally hold true weight of my small, 62 kg. I believe that the ski is ideal, best wish is difficult. I looked at the guys who are more densely me and still higher class. This just goes to them, the foot with skis is one. The body and skis – a single unit. Sumptuously. No negative reviews about these skis. Tried again right after 155 cm 165 cm. Skiing 155 significantly easier, me with my weight to cope with them much easier. They are cooler, and easier to manage. I have enough weight to crush them very well and put on edge. And do not even think about the fact that they do not hold out, just go in the arc and do not think about it. On the other skis I go, they “chik-chik-chik”, all the time, it prevents the head, it is difficult to understand how they write. It is very easy skiing, great. Other skis do not even want to test and try. 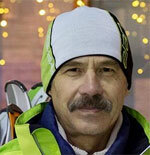 On OGASAKA I ride the longest (among russians), now in its fifth season. I have the whole range of sports ski and no any problems arose. Very worried about the stiffnes of SuperG ski, both rails but rotate wonderfully, if necessary. The first took slalom skis because it is very similar to Stokli on which I rode before. The similarity lies in the fact that when the ski edging immediately begins to cut from tip. Many people do not really like it. 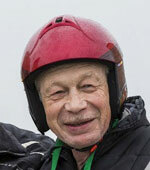 In the course it is necessary to get used to it as firstly pole pass between legs. But when you are saddled them and get used to this feature, the more frisky horses you will not find. To compare a few years ago ogasaka and stokli in the tube on ice (indoor skiing in Moscow). Sharpen the two pairs to the state of blades and made several times by two descents. Stokli were no ice, a big skid. Ogasaka very tenacious, cut without problems. One caveat, stokli was three years old, ogasaki new. Specially mark great workmanship of Ogasaka. Such good base I have not seen on any skis, perfectly flat for the entire length. Usually in the widest part of it is concave or convex. Another plus is the excellent quality and democratic platform that allows anyone to put bindings in any place that is skiing fit for themselves, and not as manufacturer decide for you. And not tormented two or three seasons. About how they turn and keep the arc will not write anything, everything is very individual. Each has its own equipment, weight and rack. But worth a try, may be these skis you were looking for all your life. 1. 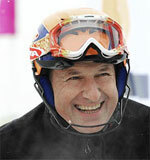 Any skier who is constantly improving his technique, aims to carve turns to perform at optimum arc, without any loss of speed and unnecessary skidding. When turning, the angle of the ski edge with respect to the surface of the snow is not the determining factor, which makes the ski drive and stable hold on the slope. The determining factor is the angle of the ski edge to the resultant force (gravity, centrifugal force). This angle is called the critical angle of the ski edge. In ski Ogasaka Triun SL, at the analysis runs, I felt quite a large range of such tilt angle at which the ski hold rhe slope and slides in a stable geometry of turn. Errors edging skiing on BLIZZARD SRC lead to vibration and bearing skidding. 2. Despite the relative stiffness of skis Ogasaka Triun SL (it comes to factory tests on the slope of a mechanical deflection skis by force biceps) are easy enough to enter into a turn, to forgive such a mistake as the input is not a tip-skiing (perhaps this is not an error) which distinguishes it from other models, and in particular from BLIZZARD SRC. 3. I suppose that is uniformly distributed stiffness throughout all the length of the the ski, allow easily manage it, forgetting some of the subtleties of the ski technique. At the end I want to note that if the owner of the ski is sincere and kind person, the skis will turn in the right direction, easily and naturally, taken the main job of turning. 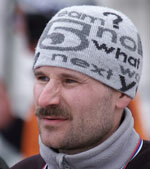 And this fact is appreciated by a well-known in amateur ski world as a sportsman Lev Ivanov. I decided to buy Ogasaka Triun SL, Japanese ski, about which so much recent talk. I feel like, after my race-stock Atomic, immediately caught my eye that the skiing felt much lighter and do not have this “atomics” sticking to the hill and ride the rails. The first few runs so I could not figure out what to do to turn, because of the feeling of lightness was afraid to make a mistake when loading skis. But after a few runs get used to and began to enjoy the pleasure of skiing. It is also worth saying that skiing, if you want very easy to break, unlike Atomic, and are lateral slip, but if you want to keep clean they are perfectly cut arc even up to slope. If in the beginning I was afraid possible instability of skis at the end of training started to catch some new technical elements that have slipped from me before, there became the ease with change edges. And in general, on Ogasaka Triun SL skiing quite soft and easy to ride, despite the fact that they are just as tough as any other craft slalom ski and even harder then Atomic if you try ski hand bend. But, as I understand it, Triun – not an ordinary race-stock ski, they are just easier (plates two, but the material plates, as I understand, not titanium alloy) and the official Ogasaka catalog not put Triun SL as worth FIS marking, although the giant and SG such labeling has. It’s hard to say why so, because it’s a top sports slalom ski. Apparently they just do not quite have complied with FIS slalom geometry model. It is also worth mentioning that Ogasaka, in principle, does not deliver on the World Cup skiing and comply with all international standards is not necessary. Well, me personally, that’s not really care, I got a race-stock slalom ski that allow better rice a technique and ride with pleasure. It is interesting to try Triun on ice. Also it is necessary to say that at the end of the second training edges still perfectly hold. Ride slalom ski Ogasaka Triun SL 165. Geometry 119-65-98 mm. The radius is 12.6 m.
Skiing set with a good sport platform. It allows you to put the bindings of any manufacturer, that certainly is a plus. This pair was set with Salomon bindings. The exterior design, in my opinion not very much. But the edges are “horse amount”. Could be sharpening very long. The first few runs I did not delight. Somehow it is not going well. Heel some wadded, Ski response to some indistinct. Something’s not mine. I decided to slightly move the bindings. Here after, the picture was completely changed. Everything was good, and everything in moderation. A clear entrance to turn, clean keeping the arc, not strong, but a distinct output. All very reasonable and balanced. Perfect balance. At least in the free skiing at the well frost slope. And all the time I was not feeling that skiing in no hurry to immediately disclose. Something else moreis waiting ahead. As if dialogue behaving. And can you do so? And if not so, but so? And in the subconscious somehow out of place sounded old song about a girl from Nagasaki. Actually, the only controversial design, but it is a matter of taste. Well, the more it seemed to me that the behavior of skis varies from position of bindigs. Stronger than other skis.